More capability. More comfort. More touchscreen. 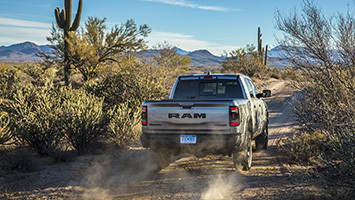 SCOTTSDALE, Ariz. – There's a lot going on with the 2019 Ram 1500: inside, outside, out back, and under the hood. New engine options — two of which feature 48-volt eTorque assistance for extra grunt — and lots of attitude-heavy trims. 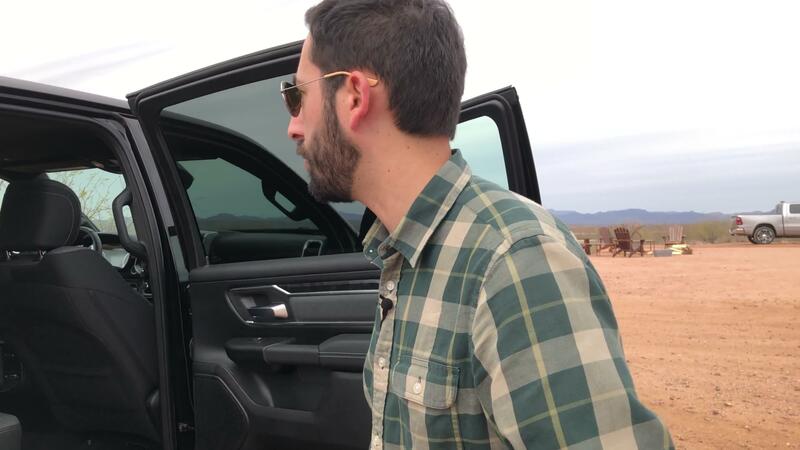 But our first experience with the '19 Ram is focused on the totality of the truck experience — taking a step back, a deep breath of desert air, and soaking it all in. Ram is staking out a fascinating niche in an incredibly competitive segment. More than anything, this is a very comfortable truck, and that's exactly what it needs to be. Remember, Ram ditched leaf springs for coil springs 10 years ago, figuring a smoother ride outweighed the cost. That didn't make it less truckish, since capabilities also increased. And the same goes here: The suspension geometry is tweaked even further, giving it better control over speed bumps in the Phoenix suburbs as well as the desert washes, guarded by saguaro sentinels. Lest you think this means the 1500 gives up anything on its predecessor, properly equipped the '19 can tow up to 12,700 pounds. Yes, with the 1500 ... not a dual-axle, heavier-grade 3500 or something. Maximum payload is up to 2,320 pounds, too — although that rating is only for a 3.6L 4x2 with a 3.55 rear end. There's got to be a tradeoff, right? Maybe Ram pinched the interior to save weight. Nope — both the Quad and Crew cabs are bigger. The Crew Cab grows more, though, with 4 extra inches of extra wheelbase finding its way into the massive space behind the front seats — there's 45.2 inches of legroom back there, which is about 5 inches more than before. This process of critically assessing the Ram, looking for clues that something was worse or amiss, simply came up empty. The only area the 1500 seems to show weakness is in pricing — generally it's more expensive across the board, by a few hundred dollars, although some of that is offset by favorable options packaging or additional content. And, of course, with increased complexity there's the potential for higher running costs down the road — something we can't evaluate until these trucks have been on the road for years. Back to the present: The conclusion we came to is that Ram simply invested in multiple areas in this truck. A bit of the cost is passed onto the buyer, but not as much as you'd think. To translate from beancounter: Pay a little bit more, get a lot more. This does extend to virtually every Ram in the range, but on our trip to Arizona there were only three significant versions available, and all had the exact same powertrain: a 5.7-liter V8 without the eTorque 48-volt electric assist system, good for 395 horsepower and 410 pound-feet of torque, and backed up by a ZF-supplied eight-speed automatic transmission — a carryover from the previous generation. No eTorques were available, period. We drove a Big Horn 4x4 equipped with the Sport appearance package on the road, a Rebel off-road, and spent a bit of time poking around a single Limited 4x4 on-site. We have enough to say about the way the basic '19 Ram 1500 works with the familiar Hemi V8 as a whole, and we'll drive the eTorque engines soon enough. Even though the eTorque-equipped trucks will be the efficiency darlings, the non-electrified V8 Ram still has a lot of aerodynamic and fuel economy features, once an afterthought in the full-size segment. The '19 1500 has, for example, an active front air dam on any model without an off-road package that lowers 2.5 inches, eliminating the need for a black plastic chin spoiler. It even has a system that pre-heats the rear differential, using engine coolant, to reduce losses from friction from viscous, cold gear oil. These things aren't cheap to design and implement, and don't result in stunning gains individually. But with no easy fixes at this point, if you don't throw everything you got at it, you'll blow your fleet fuel economy and emissions averages. So the 1500's 0.357 coefficient of drag (a measure of how easily it cuts through the air) is no surprise — and also, a slight improvement over the manufacturer's figures for the last-generation truck (0.36). To give you a sense of where that fits within the extremes, a slippery, much-smaller 2018 Nissan Leaf gets 0.28, and current-generation full-size truck competitors are right around 0.40. That aero improvement is achieved without making the Ram smaller, either. It still has a bluff, vertical front end. The traditional Ram crosshair grille is gone, a conscious break from the past, and the new grilles hide active shutters to help reduce drag. 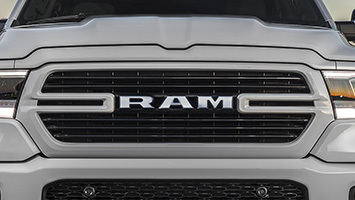 There's still a hint of the old "big rig" look to the hood bulge and step down over the headlights, a signature element that Ram's smart not to ditch, but it's no longer as prominent as it once was. 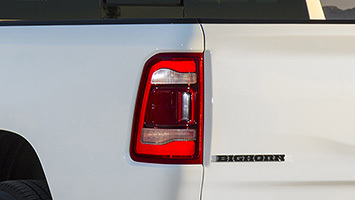 The grille gapes, a truly impressive maw, with several horizontal crossbar treatments depending on trim, all drawing attention to the "RAM" logo — spelled out up front, rather than the ram's-head shield, which is plopped onto the otherwise lightly-adorned tailgate. Styling is subjective, but the smaller and more carlike headlights strike me as a softening of the overall design. The new 1500 isn't without full-size truck swagger — the Long Horn trim is embellished with every Western trope you could imagine except a bullwhip — but the look, especially in Limited form, is more Chrysler 300 than last-gen Power Wagon. 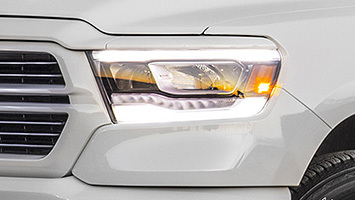 Same goes for the taillights, with tilde-esque (~) slits through which amber turn signals peek. It's subdued rather than dramatic. Maybe it broadens the truck's appeal. And if you want pure truck aggression, there's always the Rebel's handlebar mustache (Ram's description, not ours, somehow), but the outgoing truck is more handsome to my eyes. 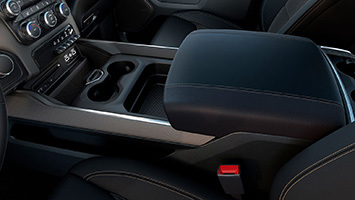 Inside, the attitude varies by trim, with no Tradesman or Long Horns around. Lower-spec Big Horns put reasonable materials and patterns in places you can see and touch, and reasonable-looking harder pieces in the nooks and crannies. The overall effect is more Jeep Grand Cherokee than work truck, and that's fantastic for truck buyers who don't want to compromise a bit. Go ahead and get up close to those nooks and crannies — this truck's got nothing to hide except lots of storage space — a cavernous 39 liters in the reconfigurable center console, perhaps the best in the segment, and 151 liters in total considering all the hidden bins and pockets. 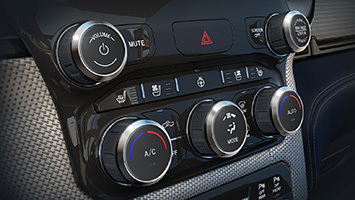 Three Uconnect infotainment options are available, including a basic 5-inch unit, the mid-grade 8.4-inch, and 12-inch portrait-style touchscreen (optional on Laramie and part of an equipment package on higher trims). We found the 8.4 to be typically competent, and the 12-inch unit impressive but nearly overwhelming. It's certainly hard to ignore — it's glitzy, but the 8.4 is fine. 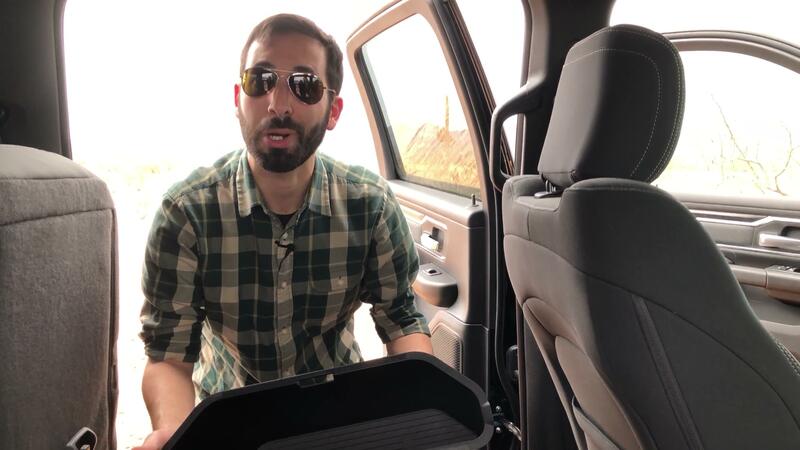 You could crawl all over the 1500 for a long time, examining minute details and testing out every door and lid (the newly damped tailgate is made of aluminum and can be remote-operated), but it's time to drive. 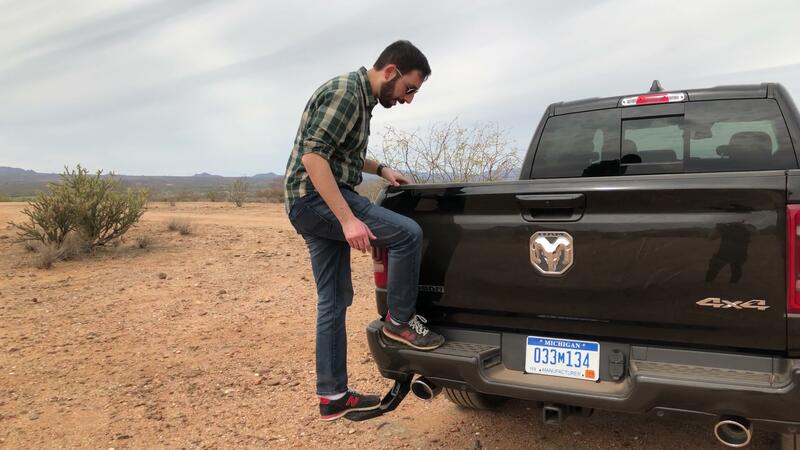 Most pickups spend the vast majority of their lives on pavement, so we drove the de-chromed Sport-appearance-package-equipped Big Horn through the various cityscapes near Phoenix: freeways, suburban backroads, arterials. 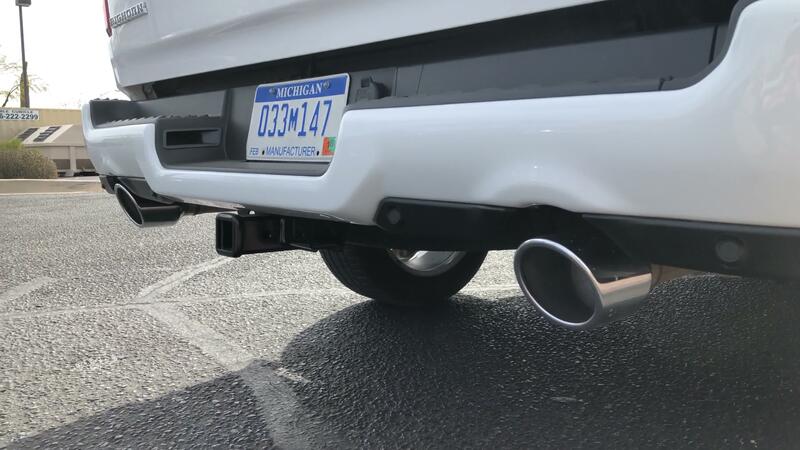 This is a quiet truck, due in part to acoustic glass and a few noise cancelation tricks, like active noise cancelation through the speakers, particularly in cylinder deactivation mode. Likewise there are chassis-mounted active tuned-mass modules — shakers, essentially — that detect and cancel out unwanted vibrations. That sounds like a lot of engineering to make the truck quieter, but it works well, and without the heft of heavy sound insulation. The ride is superb, carlike, in fact. A longer wheelbase, up four inches on Crew Cab models in both bed lengths but unchanged in Quad Cab models, doesn't hurt any in that regard. 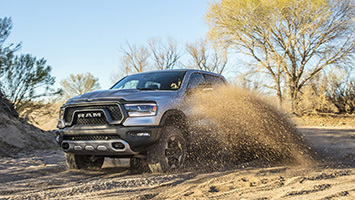 Ram credits the revised, lightweighted front control arms, a relocated front anti-roll bar, and new progressive rear coils for the improvements. But more than any of these, the internal-bypass shocks (which Ram calls Frequency Response Damping) provide two damping modes: a firm one for normal driving, and a softer bypass valve to soak up harder, faster inputs. The overall effect is a broad, forgiving damping curve, and a truck that rides plushly without falling over in a corner. Certain combinations of road imperfections will shake out evidence of the stick axle out back. Air suspension is again offered, but we didn't drive any trucks so equipped. As for the 5.7-liter V8, it's carryover, so the revisions are fairly minor. The cylinder deactivation system's operating range has been broadened — this explains some of the noise and vibration measures in the trucks we tested. It's imperceptible other than a 0.5-mpg highway mileage bump under EPA test conditions. The cooling fan is also electric now. Unless you work at the EPA compiling total fleet average fuel economy numbers, you won't care about any of this. If you go off road, you'll care about the new rear e-locker. You can option it on a truck with 4WD and a 3.21 or 3.55 final drive ratio, any truck with the 3.92, and either the base or raised suspension. 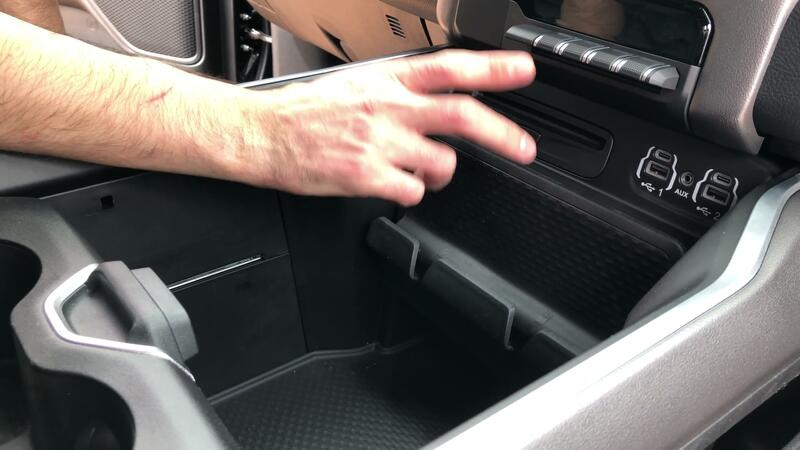 Unlike the limited-slip available with any final ratio and drive type, the locker lets the user lock the differential on demand. We ripped around in some deep sand in a so-equipped Rebel during a too-brief but highly enjoyable off-road romp — it works as advertised. 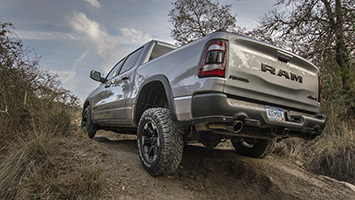 And if you want off-road goodies without the Rebel's aesthetic upgrades, there's the Off-Road package: a 1-inch lift with or without the air suspension, the e-locker, 32-inch tires on 18- or 20-inch wheels, hill-descent control, revised rear suspension geometry, recalibrated shocks, skid plates, and tow hooks. The aftermarket can and will cook up a harder-core package for a price, but for just $795 and available on all trims, it's a great package deal. 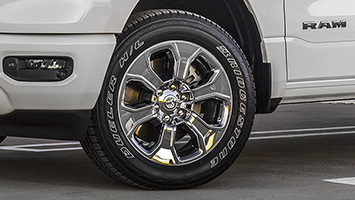 The same can be said for the '19 Ram 1500 as a whole. As we mentioned above, costs have crept up, but that matches segment trends and buyer preferences. And better standard equipment negates some of the cost increase. The only buyers who'll suffer are those on a strict budget. Since we haven't seen the regular-cab Ram yet, the cheapest Ram is the Quad Cab Tradesman with a 3.6L eTorque motor at $33,340, splitting the difference between the closest comparable Silverado 1500 and Ford F-150. At this end of the market, the spread is about $600. Remember, we haven't driven an eTorque Ram yet, so we can only speak to the chassis, but the difference is small enough that the Ram's plush ride and (probable) efficiency lead will prove to be significant factors in any buying decision. A quick aside about upgrading to V8 power. For the '19 Ram, the plain 5.7-liter V8 is a $1,195 upgrade, which is $255 cheaper than before. For F-150, going from the 3.3 V6 to the 5.0 V8 is $1,995 (or $995 to get the slightly less powerful 2.7L EcoBoost). For the Silverado, going from the 4.3 V6 to the 5.3L V8 is $1,195. Adding eTorque to the 5.7 will add $800 to the bill. In this exceptionally competitive segment of huge sellers, there's no runaway winner. Being highly customizable helps each appeal to a broad audience — and the Ram's identity-oriented trims are a huge boon. For the '19 specifically, the extra everyday livability of the 1500 is its biggest strength, considering that load-carrying capability in the cab, bed, and towed behind hasn't been sacrificed. 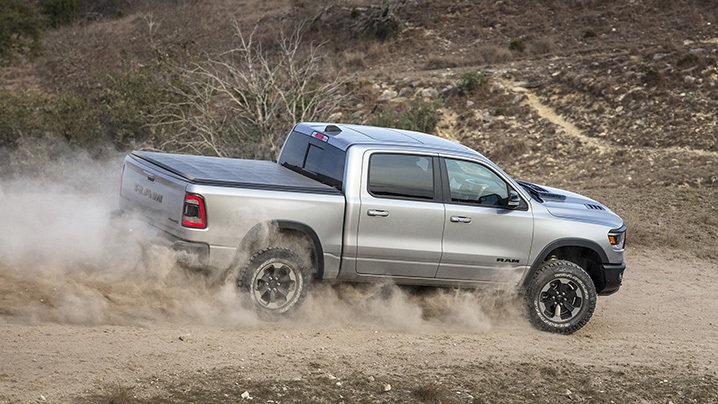 The Hemi-equipped trucks we drove were the kind of trucks that say a lot without saying anything at all. The easy and precise steering, the hushed interior, the carlike ride all will add appeal to a broader segment of buyers than just the contractor crowd. The real full-size truck battle has taken place in the cabs in recent years, with refinement and comfort becoming as important as the do-work numbers. Ram's taken that a step further, and it seems the next fight will unfold in ride, handling and quietness. 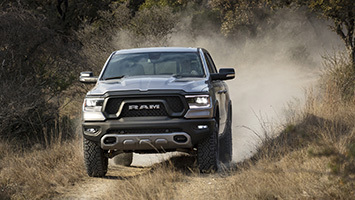 For the moment, the new Ram has everything going for it — and even more on the horizon if the eTorque motors deliver on their promise of extra power and efficiency.